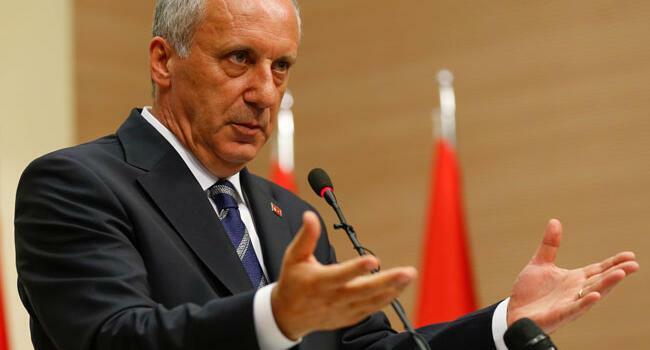 The main opposition Republican People’s Party (CHP) presidential candidate Muharrem İnce has blasted “hoaxes” that circulated on social media after the June 24 election in a series of tweets before his three-hour meeting with CHP chair Kemal Kılıçdaroğlu. “They, everything told, written or shared on the election night, were all lies, claiming I was silenced, threatened, kidnapped or was put in a position where I could not make a statement. I did not send a tweet saying ‘there were things that you do not know.’ That screenshot was fake, a hoax,” İnce said in a series of tweets on July 2. He reiterated that the CHP could not detect an irregularity in the election that would have affected the outcome. President Recep Tayyip Erdoğan was re-elected by receiving the majority of votes in the first round of elections on June 24. İnce, who vowed to “keep up with the struggle until Turkey would become a country for us all,” said he would start to tour the country on July 4. Kılıçdaroğlu and İnce met for a dinner at a hotel in Ankara late July 2 to evaluate the election results and determine the party strategy ahead of the local elections, which could be moved from March 2019 to late 2018. The two figures did not release a press statement after their dinner, which took three hours. It was the first time that they met face-to-face after the elections. “I will not run against [Kılıçdaroğlu] and be his competitor. I will not commit such disloyalty to a person who has presented me as a presidential candidate,” İnce said on July 1, as inner-party debates were the center of attention within the CHP following the election results.